Zulu Alpha Kilo has launched a new agency website that's unlike any other in the industry. This parody site pokes fun at the ‘sameness’ of every agency website. It features Zulu's fictional co-founders Frank Zulu—Chief Executive, Executive Officer, Marcus Alpha—Ultra Chief Creative Director Officer, and Katherine Kilo—VP Strategic Strategy Officer in charge of everything. “Every agency website essentially says the same thing. So we decided to poke a little fun at the sameness of the industry with our Mocku-site,” said Zak Mroueh, Chief Creative Officer & Founder. Highlights include the agency’s culture (including daily naptimes), news of Zulu's latest coup--landing the Glen's Pet supply store account. Proprietary strategic methodologies are skewered on the site. Zulu's fictional 'revolutionary' strategic process called Holist-i-think includes how to focus group test the best sandwich bread for catered meetings. 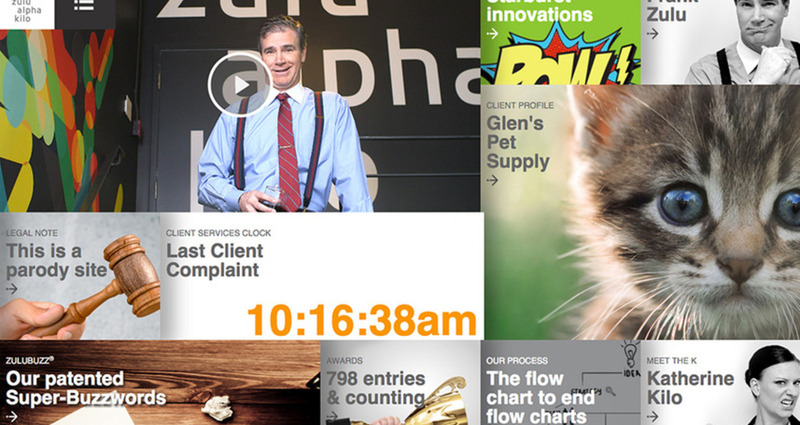 The site also features Zulu's revolutionary creative approach to B2B —using stock handshake photos. The new site replaces the "real" Zulu Alpha Kilo’s simplistic original website that contained no address, phone number, or information about senior management. Whether it's saying no to spec work or using its own website to poke fun at the industry, Zulu continues its rebellious spirit with this unconventional approach. The agency is using the new site as a chance to create entertaining content, albeit fictional. All production was handled through Zulu’s content creation division zulubot.